Like KFC Harlem United, Scotiabank Bath Estate left their best performance for last to beat visiting Bouillante Football Club of Guadeloupe 5-1 in the deciding match of the second Creole Cup Football Competition hosted by the Sports Division, in collaboration with the Dominica Football Association and Dominica Football Referees Association. 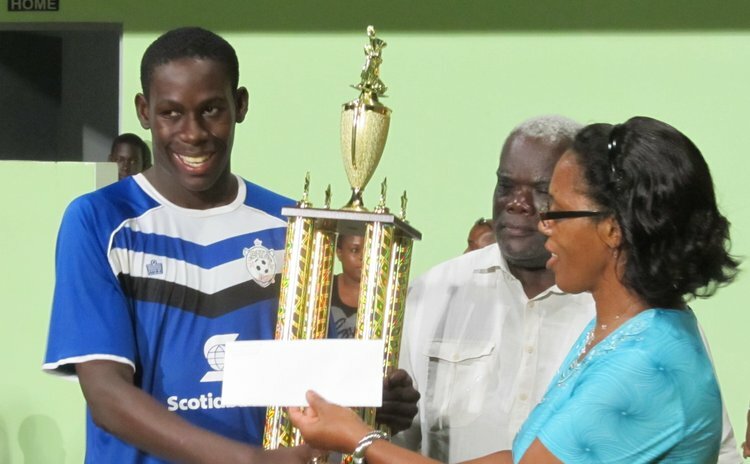 Bath Estate thumped Bouillante 5-1 (1-0 at the half) to top the competition, capture the cash prize of 2,000 Euros (approximately EC$7,000), championship trophy, and most valuable player in Delbert Graham. The competition began at the Windsor Park Sports Stadium on Friday evening August 23, with Bath Estate and Harlem United playing to a 2-all draw. Delbert Graham scored a great left footer 10 minutes before the end of the first interval, and Mitchel Joseph doubled the score from the penalty spot early in the second half. But the Harlem fight back machine got into gear with Marcel Germaine scoring twice to bring parity to the score. The following night Harlem went down 3-2 to Bouillante which left Bouillante in pole position for the championship. But Bath Estate looked quite good in their passing game so that Kurlson Benjamin finished a neat move on the right placing his shot along the ground to the 'keeper's right. Bouillante might have equalised during the first 20 seconds of play in the second half, but the player must have been surprised at the opportunity or still cold from the break and missed a one on one opportunity from inside the penalty area. Bath Estate thus reprieved doubled their score on 54 minutes when a long cross on the left was muffed by the Bouillante goalkeeper. Bouillante pulled a goal back seemingly from nowhere in the 74th minute as the Bath Estate custodian seemed to be suffering with cramps from the cool conditions. Bath Estate responded with some clinical football with Delbert Graham connected on two long fierce right-footers in the 79th and 81st minute. Chad Bertrand completed the scoring with a header in the 85th minute for a 5-1 victory for Bath Estate. The men of the match on the three nights, Marcel Germaine, Shantal Christophe, Bouillante and Lester Langlais, Bath Estate and MVP Delbert Graham received awards from Bouillante Mayor's representative Arcade Farnabe.